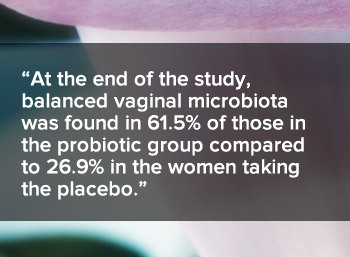 Reid G. Probiotic Lactobacilli for urogenital health in women. J Clin Gastroenterol. 2008;42 Suppl 3 Pt 2:S234-6. Shopova E. Hydrogen peroxide-producing Lactobacillus species in healthy women and in women with bacterial vaginosis. Akush Ginekol (Sofiia). 2003;42 Suppl 1:12-5. Vujic G, Jajac Knez A, Despot Stefanovic V, et al. Efficacy of orally applied probiotic capsules for bacterial vaginosis and other vaginal infections: a double-blind, randomized, placebo-controlled study. Eur J Obstet Gynecol Reprod Biol. 2013 Feb 7 [Epub ahead of print].